We have partnered with Go Forth Goods to give this leather duffel bag away to one lucky winner. You can enter into this giveaway here! 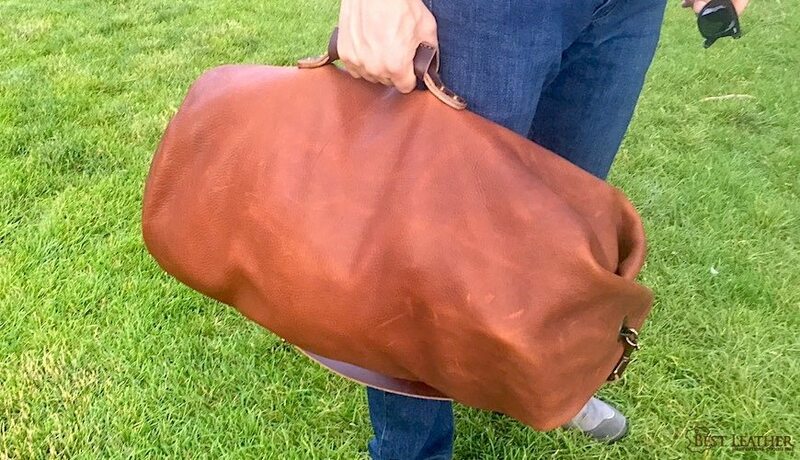 I got really excited when the opportunity to review the Go Forth Goods Gunnar Leather Duffle presented itself. A classic military style top-loading clip closure duffle, but made with gorgeous, full-grain pull-up leather. This duffle is made sturdy, has both modern and vintage appeal, and I think you’re going to love it. Founder Nathan Martin began Go Forth Goods in 2014 when bags currently on the market just didn’t fit the bill. Now they create leathergoods that are based on tried-and-true timeless designs of the past, while looking toward the future. Products are designed to last a lifetime. The Gunnar is constructed entirely from full-grain, pull-up leather, without a lining or other materials (except the brass hardware, of course). I’m personally a big fan of pure leather products. Lining in these sorts of bags tends to break down relatively early in the product’s lifetime, and the leather is much better looking (and smelling!) anyway. The main body has thick leather for strength, but it’s also tumbled for softness. The carry handle and strap are much thicker and stiff 10oz veg-tan leather. The strap has a buckle that is adjustable for length. The main body is stitched together around the bottom and center seam. The carry handle and strap are both reinforced with rivets. Construction is well done, with no notable imperfections or irregularities. One change I would have made is a rivet or addition reinforcement at the end of the center seam on the opening side. This stitch does seem somewhat vulnerable when items go in and out of the bag. However, all seams are reinforced with triple backstitching, and so far I haven’t seen any issues. Construction and materials are all done so this bag will last a lifetime–which Go Forth Goods guarantees! If you’ve used a military style top-load bag before, the function of the Gunnar will be familiar to you. It’s essentially a large bucket of space. To close it off, you fold down the pin near the top, then fold down the three rivets onto the pin. There’s a clip at the end of the carry strap that is then used to hold the rivets onto the pins, which both completes the carry strap connection and secures the duffle shut. It may not be familiar to some, but it’s fun to use and very effective for securing items. The single bucket of space takes some organization to use effectively. It’s best to put least-used or just-in-case items at the bottom. I’ve also learned a trick of using a small cinch bag or something similar to keep smaller items together in one place within the duffle. One way the Gunnar really hits a sweet spot is its size. If it was much larger, not only would it be harder to organize well, but it would also start to feel like a more cumbersome piece of luggage. The size is good for both holding all you need for a couple nights and feeling very portable and easy to use. So far I’ve taken the Gunnar on camping trips, to the gym, and on a quick overnighter or two. The just-right size and easy to use military closure have made it a pleasure to use in every case. I don’t think I’ve taken the Gunnar out without receiving at least one compliment. This bag is gorgeous. Pull-up leather is always beautiful, but across the wide landscape of a duffle bag, it turns heads! The soft leather will move quite a bit as you fill and carry it. This causes the pull-up to create a subtle marbled pattern that is always changing. The strap and carry handle are additions to the Gunnar that leaves the duffle with an overall simple, understated, beautiful look. It’s stunning yet unpretentious. You’ll love the way this bag looks hanging over your shoulder. I find myself looking for excuses to use the Go Forth Goods Gunnar Leather Duffle whenever I can. Each time I do it serves me well. It’s made well, fun to use, hits a sweet spot for carry capacity, and fantastic to look at (and be seen with!). The price may seem high for those used to more common polyester duffles, but is actually quite reasonable for the caliber of leather and assembly. If you’re gawking at the photos of this bag as much as I was, I suspect you won’t regret springing for the Gunnar. It’s a guaranteed Buy It For Life product that I highly recommend. 2 Comments on "Go Forth Goods Gunnar Leather Duffle Bag Review – $400"